Creating screenshot of your code hosted on Github. 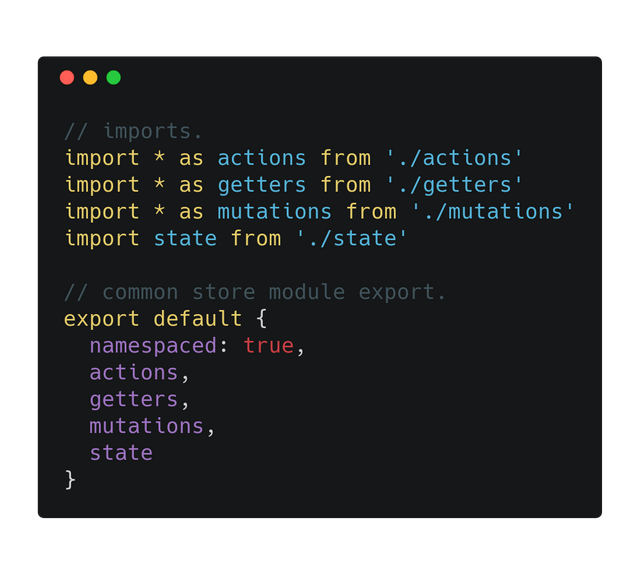 You are reading this, so hopefully you are familiar with a concept of sharing your code on the Utopian platform. 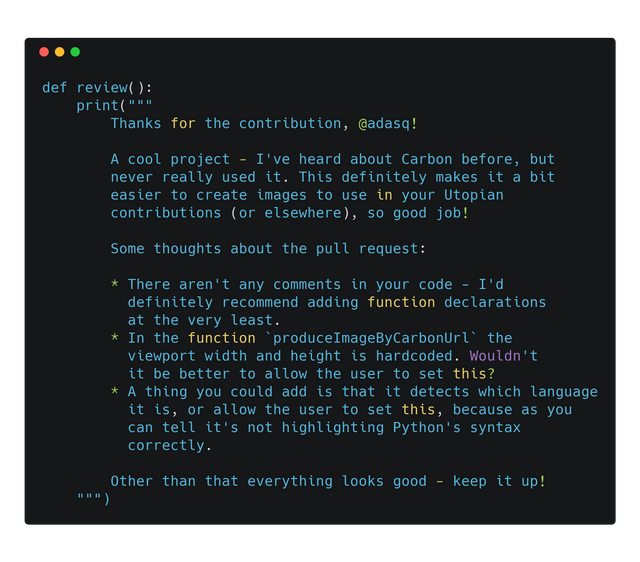 Sharing your contribution includes presenting pieces of your code as well. I have just prepared some useful (I believe) service which allows you to create a screenshot of your source code snippet hosted on https://github.com/. It is a node.js based service. Based on input URL we have to retrieve source code lines a user is interested in producing image form. Function getGithubApiUrlByGithubSnippetUrl is responsible for producing such URL. This endpoint produces JSON object, containing metadata related to given github file, including file content property we are interested in. 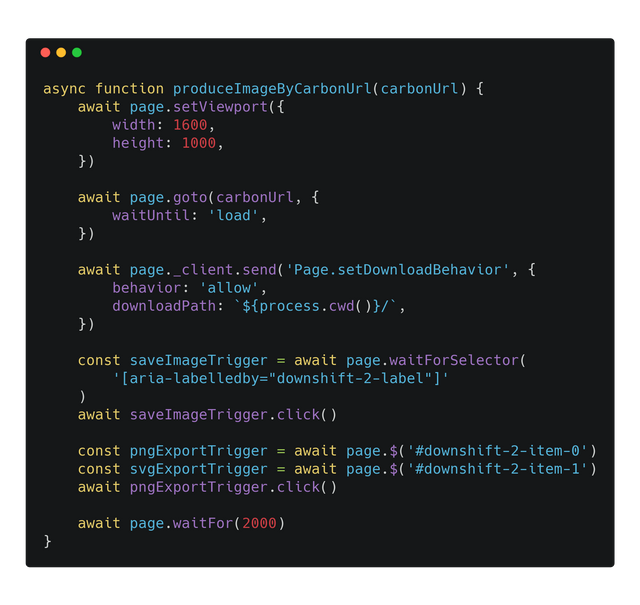 Having source code we can now use carbon, which is a web service allowing you to prepare fancy image of your source code. In order to use this service we need to open it in a browser. The best way to do so is to take an advantages of a puppeteer. This library provides capabilities to control Google's Chrome browser programmatically within a convenient API. We can open web pages, run content script on it or create a screenshot of given DOM Element. So, using headless browser, we can sends previously gathered piece of code ro a https://carbon.now.sh/ webpage, and then generate a beautiful screenshot of our source code. What is more, under the hood there is a queue logic which lets us to generate only one image at a time. So, your image might be generated little bit later than you excepted, if someone else has requested screen producing earlier. This is a limitation I decided to ignore for the sake of PoC. Of course, all code snippets has been prepared within the service, presented in the contribution. I would love to see such feature integrated with a editor provided by Utopian 2.0. So, whenever we paste snippet url - a screen is being produced automatically. That might be huge! What you think people? Any suggestions highly recommended. Post them here: https://github.com/adasq/github-code-screenshot/issues, or contact me directly on Utopian's Discord ( @adasq ) or just below in a comments section. This is absolutely awesome. I struggle with taking screenshots of my code because they always end up uneven and I don't want to spend the time and actually cut them to the correct sizes. I'm absolutely going to use this from now on. Thanks a lot! Hi @adasq! We are @steem-ua, a new Steem dApp, computing UserAuthority for all accounts on Steem. We are currently in test modus upvoting quality Utopian-io contributions! Nice work!